Vaughan insisted that off-spinner Nathan Lyon will be the difference between India and Australia, who won their first Test since the ball-tampering scandal in Perth. Former England captain Michael Vaughan has put his money on Australia to win the ongoing four-match Test series against India. After winning the opening encounter in Adelaide, India were thrashed by Australia in the second Test by 146 runs in Perth. The highly-anticipated series is currently levelled at 1-1 after the first two matches. Vaughan, who has been performing the commentator’s role in the series believes Australia will clinch the ongoing Test series against India. He also predicted that Man of the match in Perth Test – off-spinner Nathan Lyon will eventually prove out to be the difference between the two sides. 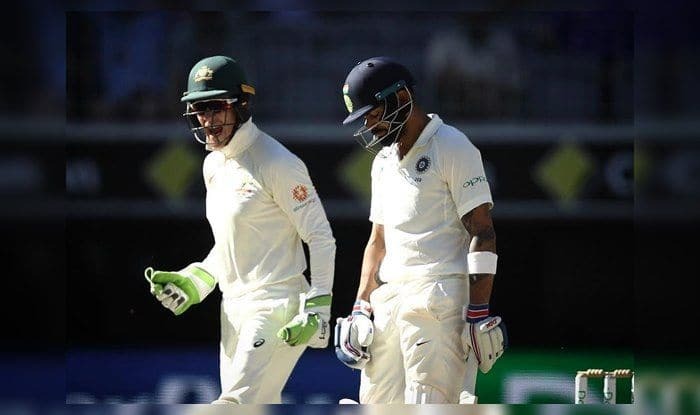 The Kangaroos won their first Test since the ball-tampering scandal in Perth to nullify the early advantage Virat Kohli’s men had gained after a memorable win in Adelaide. “Final thought as I leave Aussie … Australia will Win the series … Lyon is going to prove to be the difference … (sic),” Vaughan wrote on Twitter while announcing he won’t be part of Fox Cricket’s commentary panel for the last two Tests in Melbourne and Sydney. Lyon, who had topped the bowling charts during Australia’s 2-0 win over India in 2014-15, has given India a lot of headaches in the ongoing series. He picked up eight wickets, including the prized wicket of captain Virat Kohli early during India’s unsuccessful chase of 287 in Perth. In the latest ICC Test bowler rankings – Lyon has attained his career-best seventh spot. He has already snared 16 wickets from two matches in the ongoing series. Playing as the only spinner in the Australian bowling attack, the seasoned campaigner has complemented the three-man pace attack as the hosts have hunted in packs, successfully. Meanwhile, former India captain Sourav Ganguly has shown his faith in the abilities of current Indian cricket team and believes that the visitors can still clinch series with two matches remaining. He added that the Indian batsmen have shown too much respect to Lyon, who has picked up a five-for in each of the first two Tests. “I had thought of sending a text to Kohli but I haven’t done it yet. I wanted to tell him that you shouldn’t give so many wickets to spinners outside the subcontinent. There is no doubt that Nathan Lyon is a great spinner but so were Shane Warne, Muttiah Muralitharan and Graeme Swann,” Ganguly was quoted by India TV.